1. Preheat the oven to 160˚C, gas mark 3. For the roasted rhubarb, put all the ingredients in a roasting tin. Stir in 3 tbsp water and toss together. Bake, uncovered, for 15-20 minutes, until the rhubarb is just tender. Take out of the oven and set aside to cool in the tin. 2. Turn the oven up to 180˚C, gas mark 4; lightly grease a 23cm springform cake tin and line the base with baking parchment. For the biscuit base, put the amaretti and digestives in a large, sealable bag and crush with a rolling pin into fine crumbs. Tip into a bowl, add the melted butter and mix until the crumbs are coated. Transfer to the prepared tin; spread evenly over the base. Bake for 10 minutes, then set aside to cool. Reduce the oven temperature to 160˚C, gas mark 3. 3 For the filling, lightly beat the eggs and sugar until the sugar has dissolved. Add the remaining ingredients and beat until well combined. Pour over the base, then bake for 45 minutes, or until just set with a slight wobble in the middle. Switch off the oven, open the door a little and leave the cheesecake to cool completely in the oven. 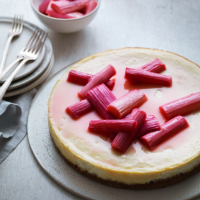 Serve with the rhubarb and some crème fraîche, if liked. This recipe was first published in Thu Feb 22 13:45:41 GMT 2018.